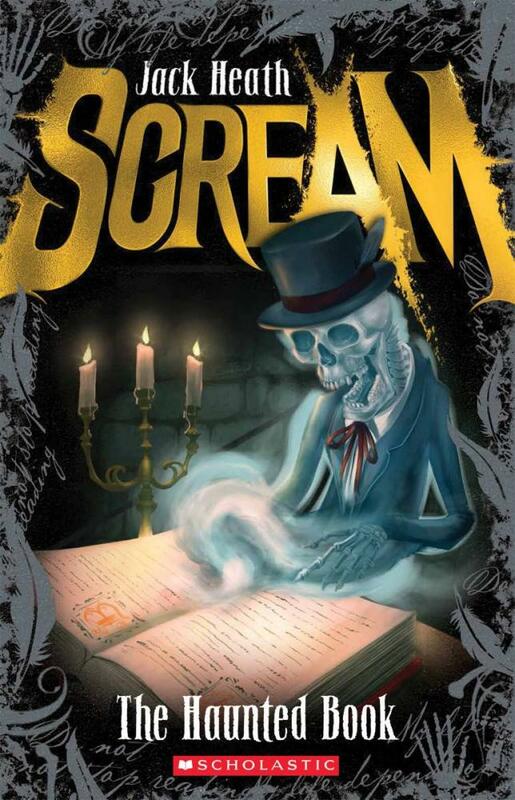 To date, Jack Heath has written five books in the Scream series. The two most recently released continue the themes set in the first book The Human Flytrap and are set in and around Axe Falls. The main characters are Dale and his cousin Sarah, with Detective Sergeant Claude Sharpe naturally remaining in the father and uncle role. The Haunted Book finds Dale holidaying with his family up in the mountains away from Axe Falls. The house they have rented is run-down and spooky looking, the floorboards creak and it contains plenty of dust and spiders. As a resident of Axe Falls Dale is used to mysterious and strange events, but when his e-reader breaks and he is forced to pick up a ‘real’ book his life begins to take a new direction along a terrifying path. The Squid Slayer is told by Sarah who narrowly escapes being eaten by a hideous smelling and wounded colossal squid washed up on the beach in Axe Falls. No one knows what has injured the enormous sea creature, but Sarah is determined to find out. The answer will have you thinking twice about that ocean swim next time you visit your favourite beach! The books are promoted as Spine Tinglers, but may also be loosely called horror. As an adult I have the luxury of being able to read these books and see through the scary bits, but younger audiences will get that spooky chill. Despite this, most will likely come back for more! This is a compelling series, perfect for reluctant or competent readers eight years and over. The series reminds me of the Goosebumps collection from many years ago, albeit each story is longer than the Goosebumps stories. This is probably no coincidence, as both series share the same publisher. The books are easy-to-read and, at under 150 pages, can be finished in a few hours. The layout that was so appealing in The Human Flytrap has been continued and each page has the vignette effect with warnings inside the covers about reading the book. The noisy-novelty-card sound initiated by opening the cover of the first book has not been carried over to the rest of the series but as the books remain visually enticing and each story spooky, the effect is not missed. At the end of each book there is an official Axe Falls Police department report written by Detective Sharpe, often providing the reader with extra information and a little twist. This grants the reader an extra small bite of the book with something they may not have predicted, and thereby Heath cleverly leaves the reader smiling. I do like the idea of using these books at school as stimuli for a unit in Stage Three on the genre of horror writing. The potential for creative writing around this often neglected style would be incredibly exciting!